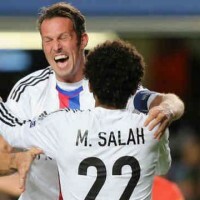 “Chelsea Football Club confirms an agreement with FC Basel for the transfer of young midfielder Mohamed Salah 21 years. The transfer is dependent on an agreement on the terms of the Egyptian international and traditional medical visit”, Chelsea announced on its official website. I must say that it has caught the eye of Londoners is that in 4 matches against them, Salah scored no less than 3 goals. Inspired against the Blues.